Touching a mango rind, which contains urushiol, can lead to an allergic reaction in some individuals. For people with a general allergy to mangoes, consuming anything containing the fruit can trigger a potentially serious reaction. Sneezing is one of the least severe signs of an allergic reaction to mangoes. Allergic reactions caused by the irritant urushiol, which is found in mango rinds, may trigger signs of dermatitis on the body part that came in contact with the fruit. Allergic reactions to mangos can cause a contraction of the smooth muscles of the airway known as anaphylaxis. A runny nose may be a sign of an allergic reaction to mangos. 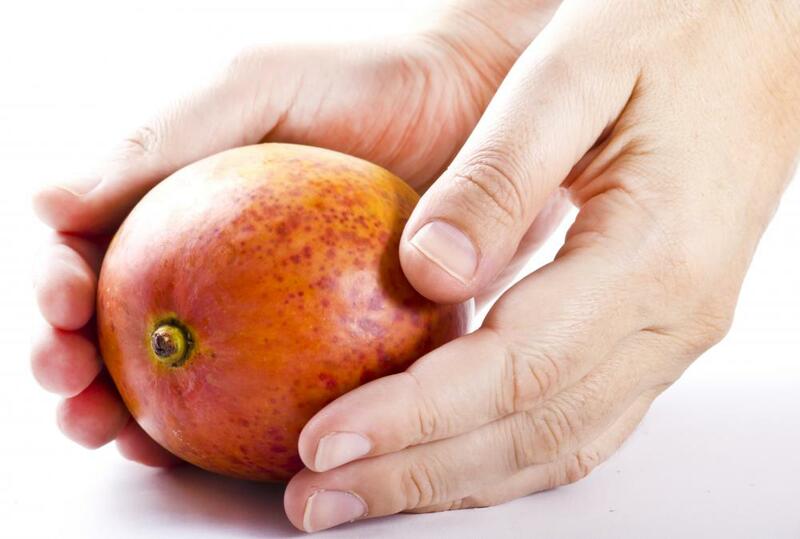 Abdominal pain may be a sign of an allergic reaction to mangos. Signs of an allergic reaction to mangos may include hives. 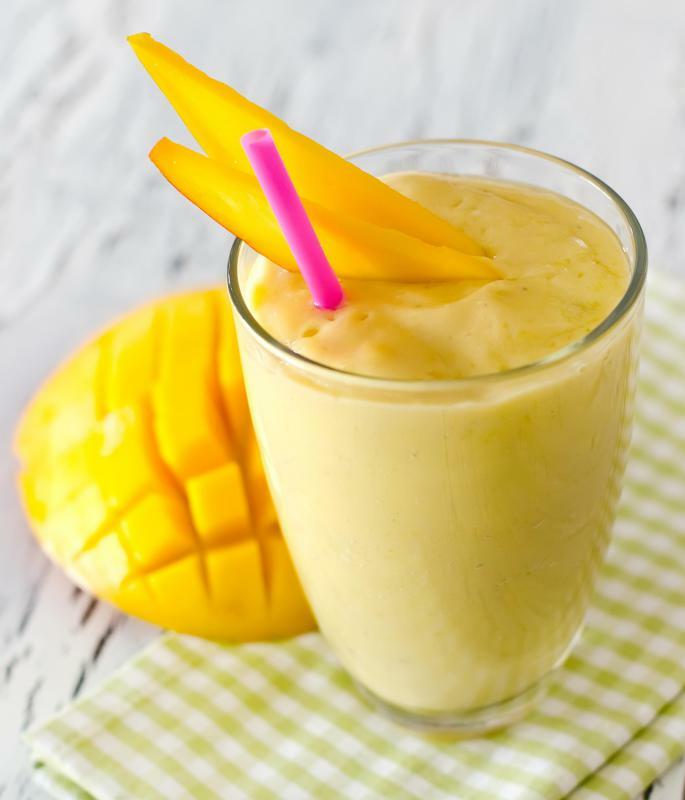 Mango allergy is a rare food allergy that is often overlooked. What many people do not realize is that there are two different forms of this allergy. The first is a general allergy to mangos, and the second is an allergy caused by urushiol, which is found in mango tree sap and mango rinds. Many of the signs of an allergic reaction to mangos are usually very similar to other food allergies including, swelling, hives, itchiness, trouble breathing or swallowing, and in rare, extreme cases, anaphylactic shock. General mango allergy happens mostly when the mango is ingested. 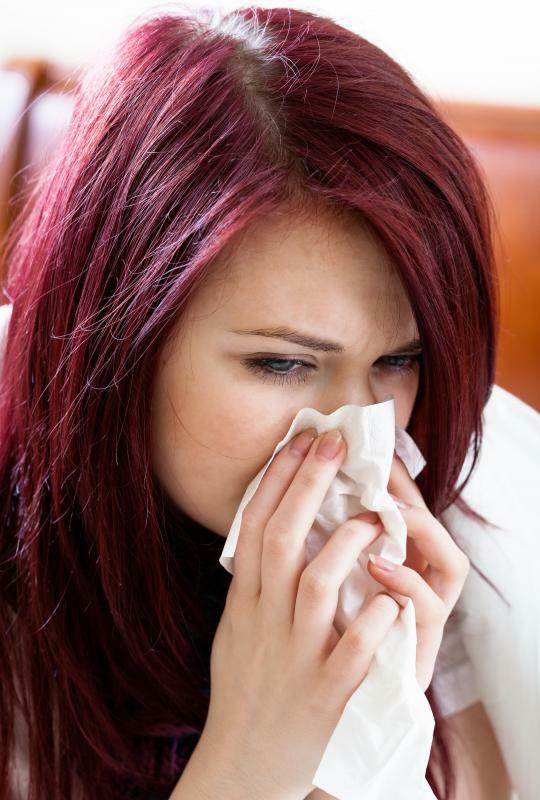 The least severe signs are watery eyes, a runny nose, and sneezing. Milder signs of an allergic reaction to mangos include abdominal pains and diarrhea. 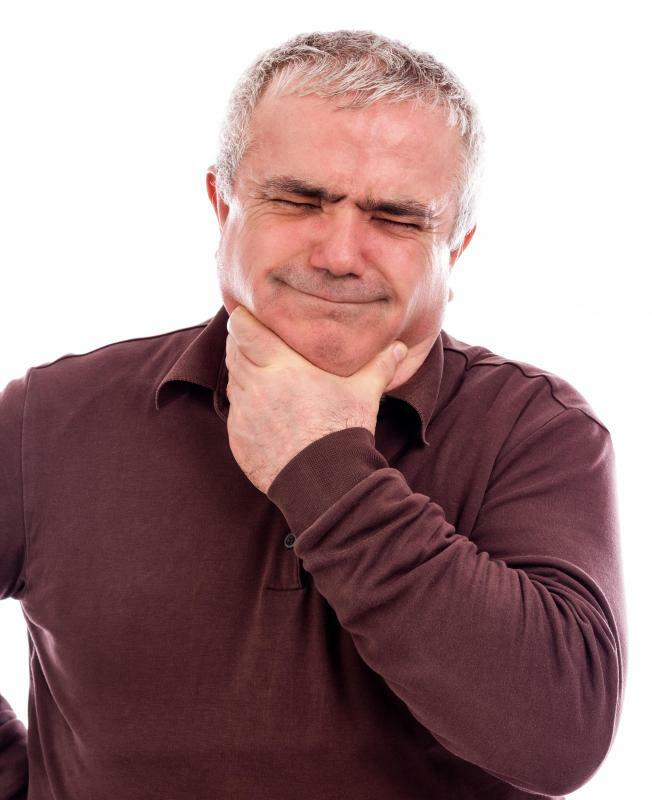 The most common symptom is trouble swallowing or breathing due to swelling of the throat and lips. This may eventually lead to a more severe reaction, such as anaphylactic shock. If trouble with breathing occur, it is recommended to seek medical assistance immediately before symptoms worsen. Mangos are part of the poison oak family, which is why the irritant urushiol is found in mango tree sap and mango skins. This allergic reaction to mangos happens when the skin of the mango comes in contact with a person orally or through touch; it usually affects only that specific area. 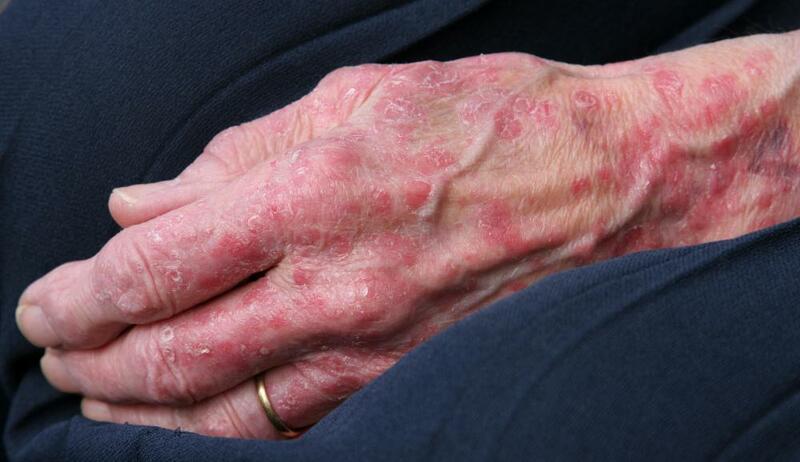 One common sign is contact dermatitis, which is the inflammation of the skin or a type of eczema. Hives also often occur, especially around the face and lips, and the skin may also become flaky or form blisters that may pus. In very rare occasions, anaphylactic shock may occur along with severe swelling, lowered blood pressure, and an itchy face. Deciding on the best method of treatment depends on the type of allergy and the severity of allergic reaction. For a general allergic reaction to mangos, an antihistamine is usually sufficient enough to allow the person to eat a mango. Hives are sometimes cleared with a cortisone cream. For more severe reactions, more intensive treatments are available. It is advisable to seek medical advice before considering or taking any allergy treatment. Preventing an allergic reaction to mangoes is typically a fairly easy task for both types of allergic reactions. 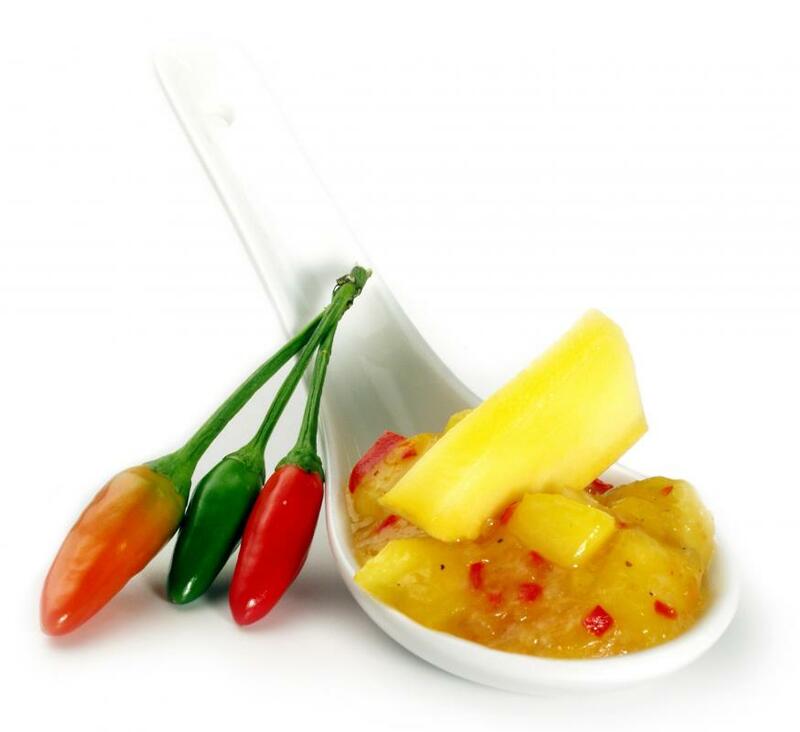 People who are allergic to eating mango may read the labels of food to ensure that it contains no mango. If a person is allergic to the urushiol in the mango peel, having someone remove the peel and the top layer of mango that touched the peel should be sufficient. What Are the Signs of an Allergic Reaction to Strawberries? What Are the Signs of an Allergic Reaction to Bananas? 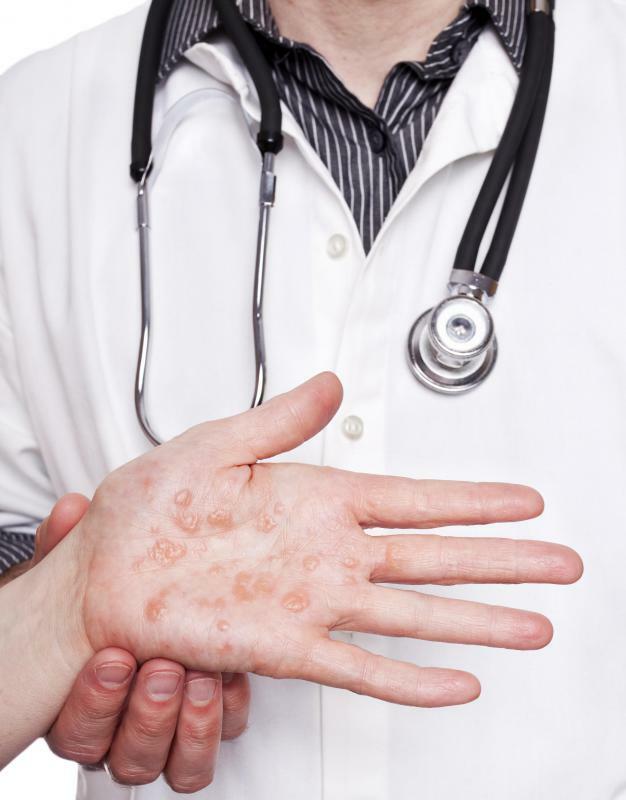 What are the Different Types of Allergic Skin Reactions? It has taken four weeks of a red, sore face and swollen eyes which have been so painful to realize I am allergic to mangoes. I brought a nutra bullet and have had smoothies every day, mostly with mango and it was only when someone told me about mango allergy that I looked it up. I have exactly the same symptoms. Very frightening. I had a severe reaction to poison ivy a few months ago, and recently had a similar (but not as severe) reaction. I couldn't figure it out, until I came across the website for the American College of Allergies, Asthma and Immunology. You can read on there about the connection between poison ivy and mangos. Evidently, mangos have the same oil on their skin and rinds that poison ivy leaves do - uroshodiol. I developed similar symptoms to those I had after touching poison ivy. My mouth felt like it had canker sores, and I had a blister-like rash on random parts of my body and face (likely from where I touched after peeling the mango). After I ate the first mango in November, it was so bad, I had spot on my chin that suddenly started weeping. I required antibiotics and prednisone because the spot wouldn't stop draining. It was very gross. I cannot believe it was from a mango. I just developed a mango allergy to the peel. I drank a juice that had some rind or peel in it and my face got red last night. I drank another today and this time it was my eye's turn to swell. Whenever I eat mango, my mom and dad peel the mango and dispose of it, which is why I've probably never shown symptoms until now. Mango peel has the same chemical in it that poison oak and ivy has, so if you are allergic to that, then you probably are allergic to mango peel too. My allergic reaction was pretty mild the last two times. I don't want to try it a third though. You should be careful around foods you are allergic to to prevent anaphylactic shock, a deadly type of allergic reaction. @feruze-- Be careful! You should avoid mangoes completely. My mango allergy started with a lip rash as well and when I consumed a candy with mango in it, it developed into a full face rash and my tongue also became swollen. My lips, my hands and feet very itchy too. I had to be taken to the hospital, my husband was scared that my throat would also swell up and I wouldn't be able to breathe. I was given a steroid shot there and then I was given additional medication in case I developed the symptoms again when I got home. It was very scary. There is no fooling around with allergies! @ysmina-- Mango allergies are very common, especially in Asia and South America where there are a lot of mangoes. There is a name for it too, "mango mouth." I think that almost everyone can have a mild allergy to mangoes because it naturally contains an irritant in it and the irritant is found mostly in the skin. So if you eat or chew on the skin, you're more likely to get it. Mango mouth causes a reddish rash on the lips and mouth. It goes away on its own in a few days but sometimes it can take up to a week. I've had it several times in the past when I was in India. It's very hard to resist fresh mangoes during mango season in India. Of course, I got a lip rash from it, but since I took an antihistamine medication, it resolved very quickly. I'm surprised to hear that people can be allergic to mango at all, because it's one of the low histamine foods that most allergy sufferers can consume. I think it is in the same family as cashew though, so maybe that's why?